The John Brown University Enactus team (formerly Students In Free Enterprise) was named Regional Champion at the annual Enactus Regional Competition held on April 17 in Rogers, Ark. JBU was represented by students Kristina Arge, Andrea Eifert, Seagan Harmon, Meghan Kenney. The student presentation team talked about the local and international impact of two of JBU’s major projects, The World Trade Expo and the Guatemala Water Project. The World Trade Expo is entrepreneurship education and a business plan competition for area middle school students. More than 250 students from nine Northwest Arkansas schools participated last fall. In total, the teams generated over $1,700 in revenue and managed 348 transactions. The Guatemala Water Project is an effort to equip and empower the community of Cotzal through the implementation of a locally owned and operated health cooperative that provides hygiene education and clean drinking water to members. Thanks to a $2,000 grant from the Lowe’s Community Improvement Grant through Enactus USA, the project was able to have a greater impact. In July 2013, a team from the JBU Enactus team will travel to Guatemala to help implement a water purification system. This year, a total of 18 colleges and universities from Arkansas, Kansas, Missouri and Oklahoma were represented at the regional competition. The JBU team will travel and compete at the 2013 SIFE USA National Exposition in Kansas City, Missouri, May 21-23. JBU has been a leading member of Enactus since 1977. 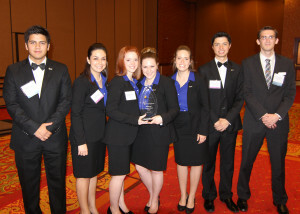 In addition to the World Trade Expo and the Guatemala Water Project, the JBU Enactus team committed time and resources to nine other efforts; four other projects focused internationally and five others in the Northwest Arkansas community, including hosting job training for inmates at the Washington County Jail, teaching basic life skills at the Juvenile Detention Center, advancing educational business related concepts with students at local and international schools, promoting social wellbeing in a number of Central American countries and leading the Small Business Summit, which provides four monthly workshops for local entrepreneurs. Enactus is an international organization that mobilizes university students around the world to make a difference in their communities while developing the skills to become socially responsible business leaders. Enactus has active clubs on more than 1600 college and university campuses and over 62,000 students (representing a total of 38 countries) are involved in those clubs.